A broom with a view. 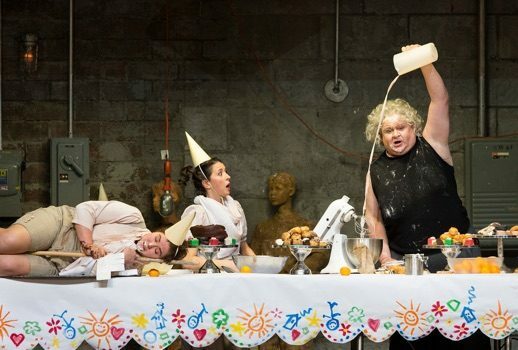 Seasoned opera-goers might be understandably inclined to skip the “holiday presentation” of Hansel and Gretel but they shouldn’t. Monday’s revival, featuring Lisette Oropesa’s ideal Gretel and Donald Runnicles’s enthralling conducting, might just be the best thing the Met has done so far this season. When I was the same age as many of the children in attendance, Engelbert Humperdinck was a British pop star embraced by those who thought Tom Jones was too racy. Soon enough I learned that the singer had stolen his name from a noted disciple of Wagner’s whose best-known work was Hansel. I’m afraid my snob genes kicked in and prevented me from knowing this “children’s opera” until I attended Richard Jones’s vividly imagined production during its premiere season at the Met a decade ago. I was bowled over by its beauty and sophistication and rued my silly avoidance of Hansel for far too many years. I’ve read curt dismissals of Jones’s rollicking, disturbing vision of Hansel but it strikes me as one of the Met’s most successful productions embracing both the opera’s wonder and horror. Since Bruno Bettelheim’s now-tainted 1976 study The Uses of Enchantment it’s impossible to ignore the pervasive perversity and brutality present in many fairy tales particularly those collected by the Brothers Grimm which includes Hansel. Jones plays up the story’s devastating hunger and threatened cannibalism most strikingly with John Macfarlane’s bold drops which range from images of a gruesome, rapacious open mouth and tongue to the progression of an empty white plate to one smeared with blood. His children scamper and misbehave with verve and spastic dance moves while their parents doggedly cope with the devastating challenges the world has thrown at them. The crowning achievement of the production is a magical forest conceived as an ersatz-dining room inhabited by wondrous human trees. The second act ends with an astonishingly moving pantomime of the children’s dream of a bounteous feast served by a dozen jolly rotund chefs each grandly presenting a platter covered by a silver cloche. I wonder why Jones hasn’t been invited back to the Met when so many others have been. My major objection to his work here, faithfully recreated for this revival by Eric Einhorn, remains the broadly chaotic presentation of the Margaret Rutherford/Paula Deen Witch. Her dizzingly hectic scene, filled with food thrown wildly all over the set along with a prominent Kitchen-Aide product placement, fails to strike the proper note of whimsy and menace. Gerhard Siegel differed considerably from Philip Langridge who originated the role at the Met: the German tenor was less wacky, more grimly determined to spit-roast the trussed-up Hansel. I continue to regret the Met’s return to using a tenor for the Witch despite Siegel’s pungent singing. I simply don’t understand ignoring the composer’s choice of a mezzo (or dramatic soprano) for the role particularly when Dolora Zajick, the evening’s Gertrude, might have sung the devil out of the part. And Jamie Barton, the Met’s recent Adalgisa, who won the Met’s National Council Auditions singing the Witch’s riotous aria surely would have made an unusually delicious Knusperhexe. Oropesa runs marathons and no doubt needed that stamina for the non-stop rigorous work-out Gretel gets in the third act. Her high sweet voice always struck just the right note of girlish delight and awe. I have heard the soprano in nearly all of her many Met roles including her enchanting Susanna and heavenly Nanetta so it was most welcome to have her back after an absence of nearly four years. Although she just had a huge success as Lucia at Covent Garden, I confess I don’t hear the warmth and drama in Oropesa I’d want in that bel canto role. She did blend well with her equally hard-working Hansel, Tara Erraught, but her weak-tea mezzo falls far less graciously on the ear than Oropesa’s ethereal soprano. While Erraught made a better impression than she had at her lackluster debut in September as Nicklausse and The Muse in Les Contes d’Hoffmann I remain puzzled at her prominence at the Met this season in two trouser-roles when I can easily think of more than a few lyric mezzos who’d be even better. In fact Lindemann Young Artist Rihab Chaieb revealed a more potent—and steady—mezzo as the Sandman while fellow Young Artist Hyesang Park delivered a strikingly clarion Dew Fairy, the role Oropesa took at this production’s premiere in 2007. Zajick, who had been miscast as Mary last season in Der Fliegende Holländer, wielded her still potent mezzo like a blow-torch as a deeply unhappy Gertrude. Zajick’s limited abilities as an actress unfortunately made her anger at the kids misbehaving much more convincing than her joy at their reunion. Her husband’s Peter’s hearty “Rallalala”s belonged to Quinn Kelsey whose Met career to this point has been a scandal; a glance at his bio in the program lists just four previous roles in nearly a decade: Schaunard, Monterone, Germont (as a substitute) and Marcello. His joint-recital last week at the Morgan Library with Marjorie Owens demonstrated again that his is one of the most beautiful and elegant baritone voices before the public today and it’s a relief that the Met has finally noticed. Following the brief Humperdinck role there’s di Luna in Il Trovatore and Enrico in Lucia di Lammermoor with Germont in a new production of La Traviata promised for next season. It’s about time. 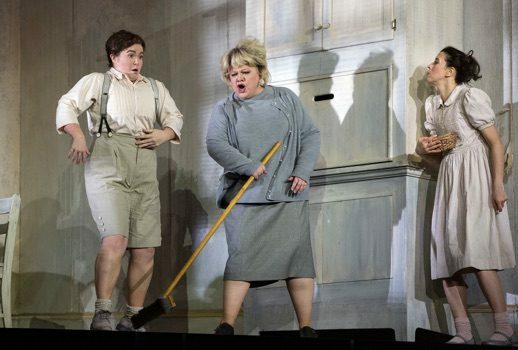 It’s also about time that Runnicles reappeared at the Met after having been missing-in-action for nearly ten years since conducting the ill-fated John Doyle Peter Grimes. His strong Wagnerian credentials (he again leads San Francisco’s Ring cycles this summer) held him in good stead for Hansel; he drew breathtakingly beautiful playing from his energized orchestra—the stunning overture alone was worth the trip to Lincoln Center. Particularly eloquent were the mysterious prelude to the second act and its ravishing pantomime. Children’s choruses usually make me itch but the touching restoration of sight to the rescued horde positively glowed while the glorious ensemble of reconciliation and rejoicing ended the evening on a transcendent high! When I got home still haunted by Humperdinck’s bewitching melodies, I determined the first order of business (after this review) was to search out Königskinder, a work I’m embarrassed to admit I’ve never heard.